Long time no blog! I’ve just returned from an amazing month in Romania. Well, I say just it’s been over two weeks now but I’ve spent all the time since I’ve been back looking at my pictures, listening to the songs and just generally getting emotional. So, I’ve finally got round to writing about my time without bursting into tears (not so far anyway!). Before I start rambling, I’ll give you a little background into what I do in Romania (if I haven’t already bored you!). I started going to Romania in 2009 when I found out about the project through Leeds met university. 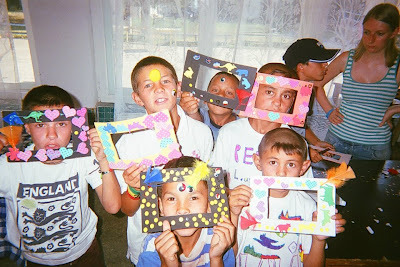 The charity Aid for Romanian Children (ARC) work with kids in a poor Roma gypsy village in Transylvania. These kids live in horrendous conditions and have very difficult lives. ARC run two summer camps with the help of Leeds Met volunteers every year which take between 60-75 kids out of the village to have a week of fun and just generally allow them to be kids again. Without wanting to use a cliche (I'm going to anyway) volunteering in Romania has changed my life and the work that the charity do to help these kids in need is fantastic. I usually just go to Romania for two weeks, but decided to go for a month this time and go on both the summer camps. I flew out on my own to meet the volunteers who were already in Romania. Flying alone on a Wizz air flight is a scary enough experience in itself! As soon as I got to the hostel to meet the volunteers it was straight into helping with the preparation for the first camp, then after attempting to catch up on some sleep we had a early start to pack the bus and go pick up the kids to start the journey to camp (all 68 of them!). The first day of camp is always a bit mad with the kids running round excitably! Each of the volunteers is given a room of kids to look after for the week. I got a room of 8 boys, who are some of the poorest boys in the village. One of them, Peti, who I had in my first year has a really tough live and sniffs glue :-( Seeing them being happy and enjoying what all kids should on camp couldn’t make me happier. This was my fourth camp with the same routine and you'd think you'd get a bit bored with it, but I don't at all. I still love watching the kids say grace before they even touch their food, seeing how much they love their new clothes and seeing them sharing their sweets with you! The week on camp was made up of craft activities, group games, a sports day and lots of playing football. I’ve been learning Hungarian (the kids speak Hungarian not Romanian!) for a while now. I was a bit disappointed that I didn’t understand or was able to speak that much in my first few days. One of the only sentences I picked up on was when playing football and one of the kids said to his friend that I played like a boy. To be fair it’s true, compared to most girls I probably do play like a bloke haha. On the last night of camp we have a disco with the kids. No matter how many times I see the kids dancing it will always amaze me. The kids learn traditional Roma dancing from a very early age and it’s impressive to say the least. The disco is always a fantastic night where the kids have a great time, but it also means it’s the last night we put our kids to bed for the last time as we had back to the village the next day. At least for me this time, I knew I’d be doing another camp. The following day we left camp early and the volunteers said goodbye to the kids until the next day when we returned to give the kids their photos! Even though I wasn’t leaving the village, it was still quite emotional seeing all the other volunteers getting upset and the thought of me actually leaving after a full month wasn’t exciting me! All of my boys and me and Laura!